Size/shape: 12mm (wide) x 7mm (deep) flowers with three ridges sticking out which represent three petals. The beads were difficult to measure. Sometimes they seemed to measure 12mm and sometimes they seemed to measure 11.5mm. 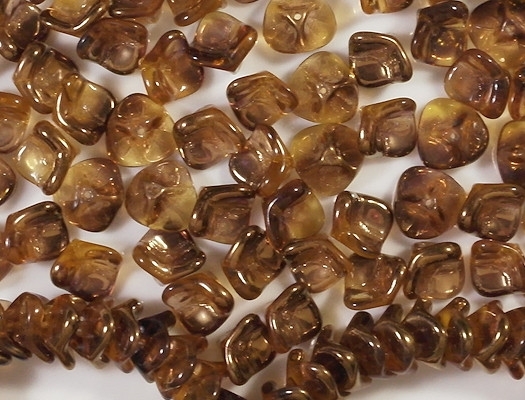 Colors/description: Translucent light topaz with a heavy, dark-gold "celsian" coating on most of each bead. 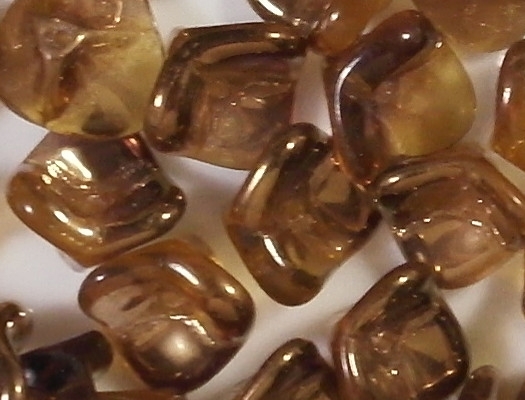 Defects: A close examination with a magnifying glass revealed that some beads have minor ripplies in the celsian coating, but those ripples can't be seen with the naked eye. 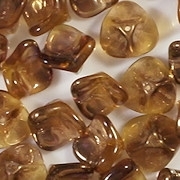 Comments: These are premium beads from my supplier of premium beads, but they are less expensive than usual because beads made of translucent glass with metallic coatings are less expensive to make than, say, opaque beads with picasso coatings. However, they are very nice. 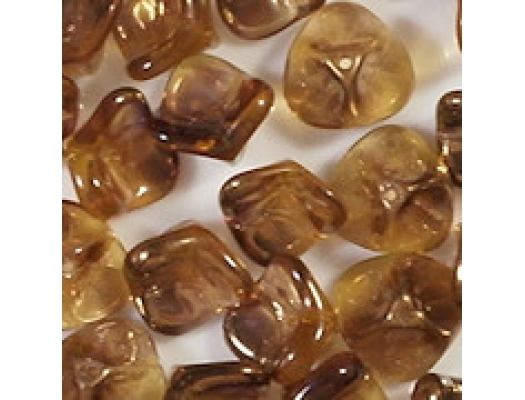 Celsian coatings are brownish gold. My picture doesn't show the amount of gold on the beads -- for some reason, my camera tends to look "through" metallic coatings (as an example, the gold in gold-luster coatings also doesn't seem to show very well). 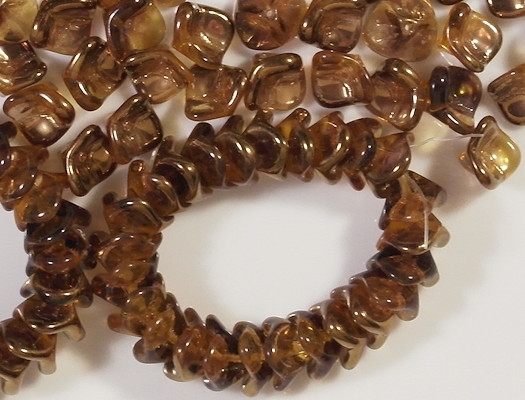 But these are very nice beads. 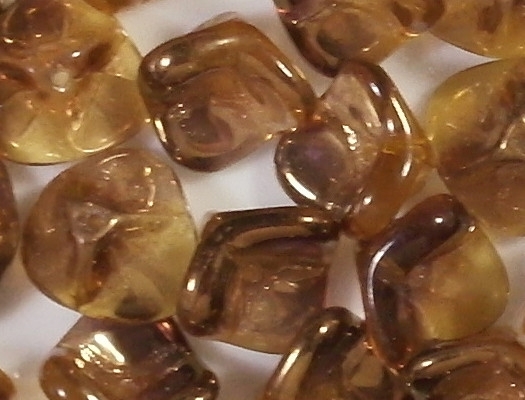 The overall effect is "dark gold". They could also be described as dark bronze. One other notable thing: The 3-petal flowers that I got from this supplier previously were always 8mm deep. 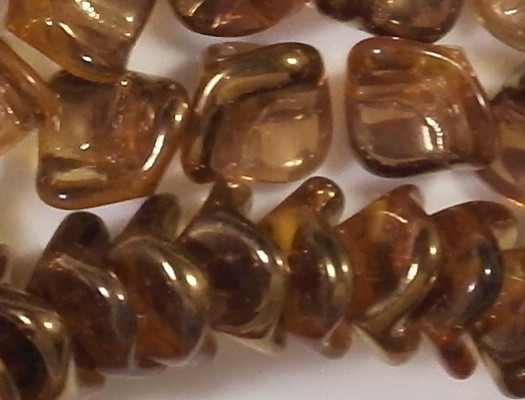 I don't know why these beads are more shallow, only 7mm. The shallower depth means that if you string several in a row, they sit together more snugly (as you can see in the picture).